Arnold “Jigger” Statz of the Los Angeles Angels slides home to score against the Portland Beavers on April 16, 1937. Image via LA Public Library, Los Angeles Herald Examiner Collection. Wrigley Field—one of the great baseball cathedrals lost to time—was built in LA in 1925 by William Wrigley Jr., chewing gum titan and owner of the Chicago Cubs, after he purchased the Los Angeles Angels minor league team that same year. And while today Wrigley Field is largely synonymous with Chicago, that park was not named for Wrigley until 1927, making the LA location the original Wrigley Field. Founded in 1903, the LA Angels were part of the Pacific Coast League. The Angels initially played Downtown in Chutes Park and later at Washington Park before finding their long-term home at Wrigley Field in 1925. 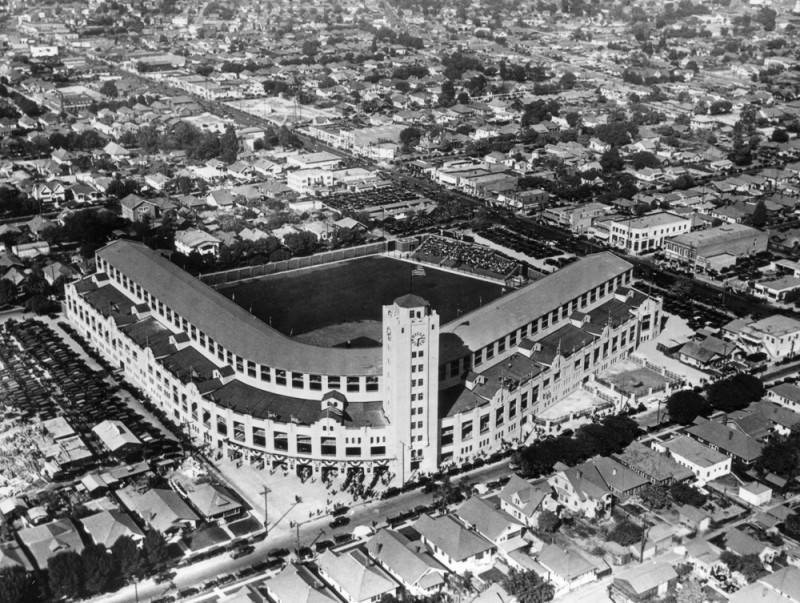 The stadium was located on 10 acres of land at 435 E 42nd Place in South LA, and was home to the Angels until 1957. The beautiful “Million Dollar Palace" boasted Spanish-style architecture, a giant clock tower, and seating for 20,000 fans. Given its proximity to Hollywood, it was featured in several movies including The Pride of the Yankees. And while the Angels were “just” a minor league team, the Pacific Coast League was the only league on the west coast until the National League’s Brooklyn Dodgers moved to LA in 1958. In 1957, the Dodgers bought Wrigley Field along with the Angels franchise and territorial rights, marking the end of an era for the Pacific Coast League. Frank “Cap” Dillon (1899-1931), manager of the Los Angeles Angels from 1903-1915. Image via LA Public Library. 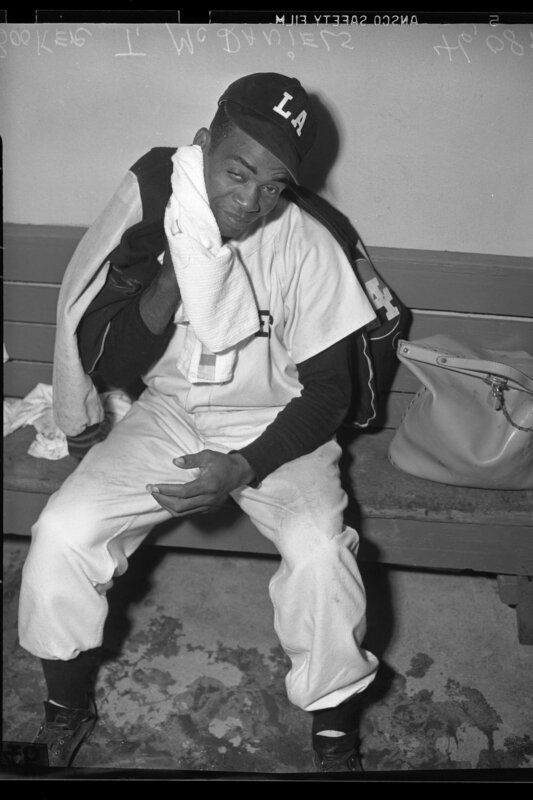 While Jackie Robinson broke baseball’s color barrier with the Brooklyn Dodgers on the east coast in 1947, the Pacific Coast League also began to integrate that same year. 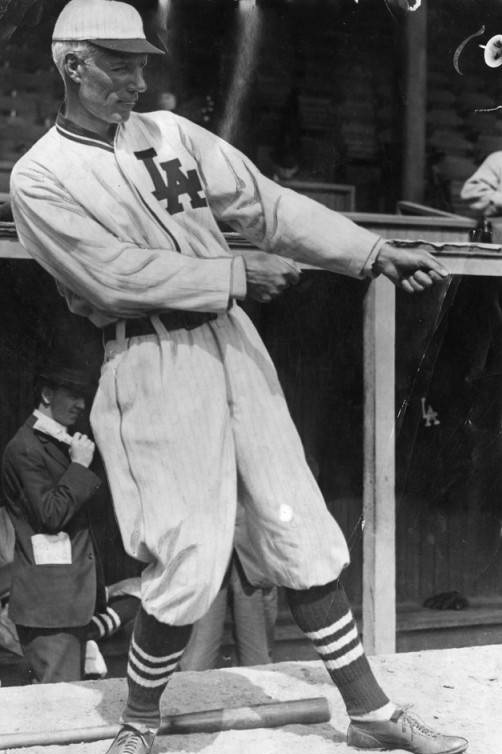 Two years later, Booker McDaniels, pictured here, was signed as a pitcher for the Los Angeles Angels. Image via UCLA Library Special Collections (1949).